room walls, a common reaction would be to put him or her in time-out. After the time-out, your child goes back and draws on the walls again. What is happening? Sometimes, time-outs aren’t the best way to show your child what’s appropriate or inappropriate. A time-out is a procedure that is used to decrease future occurrences of a specific behavior (e.g., drawing on the walls with crayons). There are many types of time-out procedures that can be utilized. A time-out can be beneficial when the “cause” of the behavior is determined. A child engages in these behaviors to communicate his or her wants/needs. For example, if Jessie is playing on the playground with her peers and kicks David, Jessie may be attempting to remove David from playing on the jungle gym or gain attention from David to play with him. It’s important to pay attention to what happens right before and right after the behaviors occurs to help determine what your child is communicating to you. Time-outs can be harmful when the person implementing the procedure overuses it and it becomes his or her “go-to” method for all target behaviors. Since time-outs are used to remove reinforcement for a portion of time, the procedure does not teach positive behaviors that the child can engage in instead. There is evidence that time-out procedures are effective, however; other less restrictive methods, such as reinforcement, can be just as effective in isolation or in combination with time-outs. What can you do other than a time-out? Provide choices for activities/items (when possible): Select between two and three choices at one time to avoid overwhelming the child. Example: If Johnny is about to eat dinner, you can provide him the choice of which vegetables to eat by saying, “Would you like carrots or peas with dinner?” This may decrease Johnny’s refusal behavior by allowing him to make his own choice, rather than being instructed to do something. Give frequent reminders and expectations throughout the day: This can be in the form of vocal or visual displays (e.g., speaking to your child or showing him or her pictures of the expectations). Example: If Debbie has a doctor’s appointment at 3 p.m., you can say, “Remember, you have a doctor’s appointing at 3 p.m., then we can get ice cream at your favorite store!” You can provide this reminder every two hours until 3 p.m. Provide specific praise for appropriate behaviors: Specific praise includes the particular action that the child did in addition to the positive words (e.g., “Wow!” “Great job”) or actions (e.g., high fives, hugs) provided. Ignore the problem behavior and only attend to the appropriate behaviors (if there is no immediate danger): You can help your child engage in the appropriate behavior by modeling or prompting the response. Example: If your child is screaming to access the cookies on the top shelf, you can ignore the screaming and tell him, “If you want the cookies, you can say, ‘Can I have one cookie please?’” Then you can provide attention and praise when he complies with politely asking for the cookies instead of screaming. Providing attention and praise to your child’s appropriate behaviors may help decrease the frequency of problem behaviors and need to use time-outs. To help with the use of time-outs and other intervention strategies to treat both appropriate and problem behaviors, contact a Board Certified Behavior Analyst in your area. Many parents express concern that their time-out strategies do not work. However, when implemented appropriately, time-outs can be a useful tool for managing problematic behavior in children. Instead of a time-out being a punishment, it can be viewed as a means to teach children how to “take a break” from a situation in order to self-regulate and calm their bodies and thoughts. Time-outs can be an effective discipline technique when done right. Give your child a warning for non-physical behaviors (e.g., yelling) that warrant a time-out. Counting to three can be an effective means to teach children that they are displaying inappropriate behaviors which will lead to a time-out if they choose to continue. 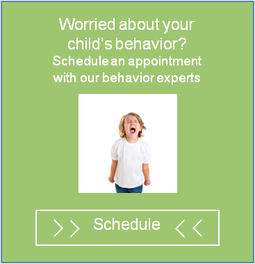 For physically aggressive behaviors, children should be immediately sent to time-out. Location, location, location. Time-out should involve a child being placed in a chair facing a wall, preferably in a room that limits distractions. Parents will often place children in their rooms which can be fun and counterproductive. In the world of time-out, boring is better! Do not provide any social attention such as eye-contact or verbal remarks when the child is in time-out. But my child will not stay in the time-out chair! At times, parents may need to prompt their children to stay seated. This could involve physically redirecting your child to the time-out chair, or standing in front of their chair similarly to a guard. Remember, do not provide any social attention when your child is in time-out. Once time-out is finished, your child should be instructed to engage in a remediation behavior (e.g., clean up toys previously thrown), or prompted to show some type of pro-social behavior toward the person target of their aggression (e.g., hand shake, a hug, saying “Sorry”). Think of alternative behaviors to teach. Underlying all problem behaviors is a function. If triggers have been identified for your child’s misbehavior, teach them adaptive ways of obtaining what they want. Catch them when they are good! Kids love attention, so make every effort to praise them when they behave appropriately. We want your children to learn that you are like a light switch that turns on for good behaviors, but off for bad behaviors. Click here to read more about positive v. negative punishment. 3 Strategies to Communicate with Your Kids without YELLING! Why do your kids continue to do the things that you repeatedly ask them not to do? When will they follow directions? WHY CAN’T YOU GET THROUGH THEM? Do you find yourself asking these questions over and over again without any resolve and feel that the tools you employ to avoid the yelling are hopeless? When yelling (despite the validity of your message), your meaning gets lost in translation and the stressful delivery is what is heard and reacted to. Use these tips to avoid getting to the point of desperation, where yelling is the knee-jerk response. https://nspt4kids.com/wp-content/uploads/2016/05/nspt_2-color-logo_noclaims.png 0 0 Ali Swillinger https://nspt4kids.com/wp-content/uploads/2016/05/nspt_2-color-logo_noclaims.png Ali Swillinger2013-11-19 19:49:262014-04-20 08:55:453 Strategies to Communicate with Your Kids without YELLING!